Beautiful dress with cut-out below bust. Great for a Tea Party, Summer Day, Bridal Shower, Easter and more! New with tags. Regular price $66. No matter what, we’ll make it right! 50” front neckline to hem. 22” front chest seam to seam. 48” side underarm to hem. 48 Center back to hem. It is gray with a yellow, aqua and teal print. The waist and top back of the dress is stretchy. There are buttons going down the front. 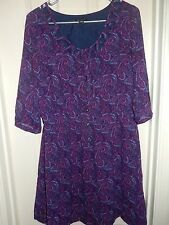 I LOVE RONSON BLUE PINK PURPLE PAISLEY 3/4 SLEEVE 6 BUTTON ELASTIC WAIST LINED DRESS SIZE M.
Sheer Floral Dress. Color Grey. Type Dress. Discover daily new arrivals in all seasons, sizes and styles that you can't find anywhere else. Material Cotton. All details of the product have been included. Flowing, lightweight strapless dress. Lined. Great condition. Material Cotton,Nylon,Polyester. Type Dress. Discover daily new arrivals in all seasons, sizes and styles that you can't find anywhere else. Color Green. All details of the product have been included. VERY NICE LINED CASUAL DRESS. SIZE X-LARGE. ELASTIC WAIST WITH PARTIAL BUTTON FRONT. NECKLINE HAS OPEN WEAVE WITH STRING RUNNING THROUGH IT. COLORS ARE MUCH RICHER THAN WHAT SHOWS IN PHOTOS. I Heart Ronson high/low Floral dress with ruffle/flowing hem. Marked size 12, fits more like a 10. Elastic waist. 43"- 45" length from shoulder. point collar. Discover daily new arrivals in all seasons, sizes and styles that you can't find anywhere else. Color Black,Green,Purple. Type Dress. Material Polyester. All details of the product have been included. Dress is lined. Shell: 100% polyester. and lining 100%Polyester. From front side to hem the dress is 30.5" long. waist Pleated. You are considering fabulous dress from I HEART RONSON. Beautiful dress from I Heart Ronson. I am SOOOOO incredibly easy to work with. Condition: Great condition - mild wear. txzj pxzj2834 txzj67. Material Rayon. Discover daily new arrivals in all seasons, sizes and styles that you can't find anywhere else. Type Dress. Color Black. All details of the product have been included. Item Details. Trendy Dress. Material Polyester,Rayon. Discover daily new arrivals in all seasons, sizes and styles that you can't find anywhere else. Type Dress. Color Black. All details of the product have been included. 16" From bottom of arm hole across chest to otherside. 36" From top of shoulder to bottom. dry clean only. Previously worn in clean condition. Stylish Dress. Color Multi Colored. Type Dress. Material Polyester. Discover daily new arrivals in all seasons, sizes and styles that you can't find anywhere else. All details of the product have been included. Color Turquoise,Pink. Type Dress. Material Polyester. Discover daily new arrivals in all seasons, sizes and styles that you can't find anywhere else. All details of the product have been included. Item Details. I Heart Ronson, multicolor, v neck, long sleeves, dress. Dress has a side zipper. Colors are: pink, black, purple, green, and blue. Swapdotcom Category Kids Apparel > Skirts & Dresses. Material Cotton,Polyester. Type Dress. Discover daily new arrivals in all seasons, sizes and styles that you can't find anywhere else. Color Black. I Heart Ronson. Sleeveless Strappy. Fashionable Dress. Discover daily new arrivals in all seasons, sizes and styles that you can't find anywhere else. Type Dress. Material Cotton. Color Black. All details of the product have been included. This is a really great piece for your fall wardrobe! Super cute knit top with a flowy layered bottom. I think this would look super cute with a jean jacket and boots! Body: top: 95% cotton 5% spandex - skirt: 60% polyester 40% cotton. Color Grey,Purple. Type Dress. Material Polyester. Discover daily new arrivals in all seasons, sizes and styles that you can't find anywhere else. All details of the product have been included. Item Details. Rounded v neck and tie in the back. I think I only wore this once for a wedding but versatile enough for many occasions. Size Small. Check them out. · I will make every attempt possible to resolve the issue if we made a mistake. (It happens). · If there is a problem, we can work together to resolve the problem. • XSmall Leopard Print Polyester Dress with Black Polyester Under Dress. • Dress length from neck to back hem is 36”. • Invisible zipper under arm. • 100% Polyester. • Machine wash. I Heart Ronson Green Hi-Lo Sleeveless Cocktail Dress, Small w/POCKETS! Side seam pockets. I am always open to helpful suggestions! Length: 40"Front/50" Back. Fully lined. Pictured above is the EXACT item you will be receiving. This item is pre-owned andnot new. Super cute! Perfect addition to any wardrobe! Stretchy A-line halter dress has horizontal stripes across the skirt and chevron stripes up top. The material is soft, a little stretchy and not too clingy. The stripes and the halter neckline are very flattering. Order a Clean Out Bag and refresh your wardrobe. Earn a little cash or credit. Apparel Conversion Chart. Japan21 21.5 22 22.5 23 23.5 24 24.5 25 25.5 26 26.5 27 27.5 28. Our resale experts ensure there are no broken zippers or missing buttons. Black see through blouse with 3 buttons and lace, long sleeve size M.